The question was asked: Is this inevitable with any debt-based system? Short answer for now. ;) Systemic collapse is inevitable as long as the item used for lending is the same item used for saving. In a gold money system with gold lending (which is always demanded by the collective will) fractional reserve banking is the inevitable result. And from there, bank failures are the inevitable result at the first sign of panic (loss of confidence). And from there, some of the savers lose their money. In a fiat system, the fiat is lent and the savers hold the notes, one way or another. This lending and note holding always increases the money supply just like gold lending and gold-denominated notes expand the gold money supply. You lend something and then you can claim it in the form of a note while the borrower claims it in the form of the currency. Even the notes circulate as they become marketable. So lending always expands the money supply, whether it is gold or fiat. And when the savers save in the same thing being lent, collapse ultimately comes (or at least threatens), whether gold money or paper. And then the system must undergo a fundamental change one way or another. The solution is quite simple. And I didn't come up with it. The problem is that at the point of collapse, some of the savers are wiped out, whether gold money or fiat. Think about those at the back of the line during the bank runs of the 1930's. They didn't get their gold. They lost their money. Today we don't have this problem anymore. The guy at the back of the line gets all his money, it's just worthless in the end. We solved the problem of bank runs (bank failures) but not the problem of value. It's a concept so simple, yet so foreign (or alien) that almost no one can grasp it. Yet it has been around for quite a while. The bottom line is that ALL money systems are debt based as long as you have lending and borrowing. And the process of lending and borrowing always dilutes the money supply and hurts the value of the money. So why should savers save that same money? Why should national treasuries be at risk of a currency crisis? A nation's treasury is arguably one of the more vital forms of savings in civil society. Should a nation's treasure be capable of vanishing in a flash crash? When we talk about gold money we often use the term "hard money." And one misconception that pops into most people's mind is that "hard" money means hard like a rock, or hard like a piece of metal versus "soft" like a piece of paper that folds nicely into my wallet. Or the ultimate soft, a digital electron that moves at the speed of light. This may not seem like a big deal, but I think it is. What is actually meant by "hard" money is that it is difficult, or hard to get. The opposite of hard being easy, not soft. Hard money cannot be expanded easily (without risk) because it has an anchor in the physical world. We generally think of the people that want a "hard" money being the stodgy old rich Republican conservative white men that already have money. They want a "hard" money so the paupers will have to work "hard" in their big industry factories to get some of it. And so the money they already have will retain its value. On the other hand, the debtors like easy money, especially the kind that loses value over the short term making repayment of their debt easier. The farmers love easy money. They take out a loan when they plant and by the time they harvest they are getting more money for their crops than they did last year. And the seed loan is easier to pay than when it was originated. More cash, easier terms, less pain. So here's the question. Why can't we have hard money for the savers and easy money for the debtors? Is this possible? Could it work? Now imagine that some people living under the "exorbitant privilege" of the United States for half a century spent a few decades designing the principles of a new currency that would help get them out from under that burden; the burden of supporting the perpetual trade deficit of someone else. They would have had a long time to evolve their thoughts and ideas and create a currency architecture unlike the world had ever seen before. Imagine that they were working on this for at least 37 years. 1962 - The European Commission makes its first proposal (Marjolin-Memorandum) for economic and monetary union. Obviously, now, the euro has its "easy" money for lending to the debtors and lubricating trade. Just look at the European banks or Greece getting in trouble. They just print up a bunch of euros and loan them to the banks or Greece at better-than-market terms. Voila – EASY MONEY. But then the euro also has its savings, its "official reserves," which are specified to be at least part in gold. At the beginning, in January 1999, they were 30% in gold bars. And they also legislated that this gold should FLOAT against the new currency. So, now, for 46 consecutive quarters they have religiously revalued their reserves – their savings – against the euro. Gold: EUR 1010.920 per fine oz. Gold, floating in euros. Hard money floating in its own easy money. Not dollars, euros! Savings floating in debt, not being dragged down by it. The store of value floating – PUBLICLY – in a swamp of medium of exchange. What else? Oh yeah! They now sell gold to the citizens right from the tellers at the bank (in some places? ), with 0% VAT. Everything else has a VAT, including silver. If I recall, silver has a 17% VAT (perhaps someone in Europe can confirm). That's "Value Added Tax." Crazy, huh? Gold - 0%! What else? Oh yeah! They convinced the EMU members to stop selling off their gold. This was a big problem. Politicians love to sell off the gold reserves to fund their pet projects. But the European CB's put a stop to that with the WAG in 1999. They limited the CB sales of gold to 400 m/t per year total, among all the CB's. So they had to cooperate not to go over that amount. Then they renewed the agreement in 2004 and again in 2009. And all the while the sales diminished until, in 2009, they reversed! In 2009 they actually took in some gold! What do you think will happen to their "savings" (I mean "official reserves") when the claims on foreign currency (dollars mostly) default through currency collapse? Of course gold will rise! Will it rise more than 66%? In dollars that would be about $2,100. You think gold will exceed that when the dollar collapses? Will it exceed that value in euros? If it does, the euro's "savings" will rise, even without selling a single dollar! Dollar value will just disappear and reappear in the gold! A transfer of wealth, so to speak! That's the beauty of savings that FLOAT!!! Hmm… let's see. Did they actually pull it off? Did they create the perfect currency? With hard money for the savers and easy money for the debtors? Well, Greece and the banks are getting plenty of easy money right now, and the hard money is rising in value along with the process. I wonder how it will all work once the dollar system's conjoined twin, the paper gold market, fails along with the dollar. How well will their hard money savings float against the easy money transactional currency once there is no fractionally-reserved paper structure weighing it down? Should be pretty amazing, huh? And I wonder what the price of gold coins will be then. They may have to mint tiny amounts with more alloys. Do you think? I bet a pure ounce of Maple Leaf will become a family heirloom at that point. Wonder if it will be soon? Hey, how much are those Maples right now? 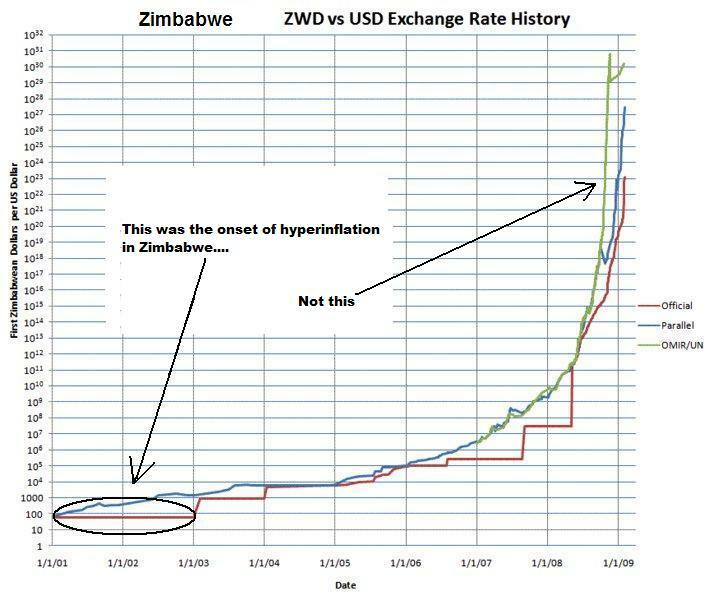 Many people look to the Weimar Republic in Germany and Zimbabwe as examples of hyperinflation, which were the results of government intervention and bad policy, and make parallels to our current predicament. In both cases wheel barrels and armfuls of cash are used to purchase everyday items, such as sundries. The merchants in the Weimar Republic would charge customers by the pound of currency rather than its face value. What you are seeing in these pictures is physical currency, not digital currency. In the US economy there is only a small percentage of the money supply that is actually in physical currency form, with a good deal of that physical currency held outside the US. My point is that there simply isn’t enough physical currency to create a hyperinflation scenario similar to Weimar or Zimbabwe. While it is true that the Fed is creating copious amounts of money at the moment, it is only being created in the digital form and not the physical form. The term ‘running the printing presses’ is misleading you to believe that the Fed is printing currency when in reality it is creating a series of 1’s and 0’s that are being deposited into virtual banking accounts. All digital. The digital money being ‘printed’ by the Fed is the type of money that most people would normally assume to be hyperinflationary; it’s the most potent type of money, it’s high-powered money and it forms the monetary base money. High-powered money is the foundation of the fractional reserve banking system. In the perfect economic climate this high-powered money would be loaned against to create 10x the amount of credit-money. But we currently don’t live in that perfect economic climate and that high-powered money is getting almost no traction at all. You have to have an economy that is functioning properly to ignite those digital dollars. I put this image here again so I can refer back to it from time to time. Throughout our journey up a graph similar to this one, there will be several monetary events which are difficult to contemplate right now. But I hope to ease this difficulty. And I also hope that previsualization will make it a little easier on my readers when this monster seemingly rears its ugly head "right out of the blue." In my last post I mentioned the "excess reserves" that will ultimately have to be printed into physical cash. This is one of the monetary events that will happen near the beginning of the graph above. It won't require wheelbarrows at that point, but as we move up the graph you will need bigger and bigger ones. An SUV would actually be quite handy. Not a pickup truck, though (wind will blow your cash away). So be sure you have some gold so you can afford the impossible price of scarce gasoline for your SUV! In Gonzalo Lira's second hyperinflation article, he asked the question, "Where will the bundles of cash come from?" Great question! And he answered it with "palliative printing." This is another of the events on the journey up the graph. Only "palliative printing" is near the top end of the graph. Gonzalo correctly points to "palliative printing" as a wheelbarrow-enlarging event, which comes at the very end stage of a hyperinflation. And he presents it as palliative to the people. But this printing is usually most palliative to the government and its expanding rank of stooges. Sure, there will be "welfare" along the way, but for the most part the freshly printed cash will buy the most goods and services for the first hands it touches. And then less for the second. And even less for the third and so on. And this prime purchasing power will be mostly reserved for the government that prints it. So these are two easily identifiable monetary events. I haven't gone into them in much detail yet because there is a deeper issue that we need to fully understand first. And that is the fundamental difference between digital money and physical currency. 99% of everyone has no real understanding of the difference. The few deflationists that think they understand what will happen will tell you to hoard a boatload of cash. This advice will help you for maybe a week to a month. If you stored your emergency supplies like you should have, it won't help you much at all. And if you hoard only cash in lieu of real stockpiles of necessities and gold, then you will have ______ yourself in the end. The week I'm referring to is the much-ballyhooed "bank holiday," while the Fed scrambles to get fresh cash out to the banks. It will last anywhere from a few days to two weeks in my estimation. And during that time, cash will have more value than plastic. But to get where we are heading with this discussion, we must understand the fundamental difference between digital money and cash as I said. Most simply stated, in our modern system – cash is to digital money – as gold was to cash – during the gold standard years. Let this sink in. Cash will become worthless, unlike gold after the 1971 parity split. So what will happen to digital money (today's "1970's dollar")? And what will become of gold? Digital money is the same as what I call "credit money" or "balance sheet money." It is "thin air money." But… there is a fundamental difference between "thin air money" from a private bank and "thin air money" from the Fed. A HUGE difference. More on this in a moment. When a bank creates money "from thin air" it is creating a liability upon itself. It owes a dollar. Yes, it owes a physical dollar once it creates new "balance sheet money" "from thin air." And unless it can legally print that physical dollar (which only the Fed can), then it must earn that physical dollar it now owes. So if you borrow a dollar from a bank which it conjures on its balance sheet "from thin air," and then you walk out with a physical dollar, that bank is now short one dollar. But on the asset side of its balance sheet it has a note that says you owe the bank $1.10, which is why the bank let you walk out with that dollar. But if you borrow a dollar from the bank and leave it in your account, then the bank still owes you a physical dollar while you owe the bank a physical $1.10. And when you pay the butcher with a $1 check and the butcher deposits that check into another bank, all that does is transfers your 'physical $1 claim against your bank' to the other bank. Your bank now owes the butcher's bank a physical dollar. And that other bank owes the butcher a physical dollar. Now if the butcher pays the baker a dollar for a loaf of bread, with a check, and the baker deposits that check in your bank (you and the baker have the same bank), then that cancels out the physical dollar your bank owes the butcher's bank. And the butcher's bank no longer owes the butcher a physical dollar either. So as you can see, "thin air money" is really just the 'physical dollar debt' of the banks that gets shifted around from bank to bank. So imagine if the bank were to write itself a big profit. All it would essentially be doing is saying, "I owe myself a dollar." You should try this. Make a balance sheet and oblige yourself to pay yourself a million dollars. Then go see if you can spend it! I tried this once. Trust me that it doesn't work! So all this digital money that everyone thinks has replaced physical cash is actually fundamentally inferior to physical cash in a **SIMILAR** way to how physical dollars were fundamentally inferior to physical gold in 1970. But the big difference between then and now is that physical dollars CAN be created at will. BY THE FED! Gold, obviously, cannot. Now let's get back to those excess reserves held at the Fed for a moment. They are FED liabilities, which are different from private bank liabilities. Fed liabilities are fundamentally different because the Fed can print gold, or at least gold's equivalent in today's banking system. The Fed can print physical dollars. So Fed liabilities are contractual obligations to PRINT gold, I mean physical dollars, while private bank liabilities (M1, M2 etc…) are all contractual obligations to EARN or find (or collect) physical dollars. So what happens when the banks can't earn the dollars that everyone thinks they have on deposit? …at some point the people lose the faith and begin turning over the money stock trying to grab real wealth. The timeframe of this switch in behavior is still up for debate with me. As I say, I've kinda given up on the timing angle. Not only because this is impossible to time, but because I've finally realized that it doesn't matter. These goofballs that keep saying they know the timing and it's years away couldn't be more wrong. Yet they look like geniuses every time it doesn't come. Timing is a fool's game because hyperinflation is like an earthquake. It could hit at any moment once it is overdue. …but the printing of physical currency is one of the last stages in the game. No it's not. The printing of physical currency will be the central theme all the way up that curved graph. Hopefully above you got the point that digital currency is simply a promise by private institutions to find you a physical dollar that they don't yet have. Digital currency only circulates as a tethered unit, tethered to the institutional circuit of banks. Imagine a dog run, where you put your dog's leash on a taut steel cable and your dog thinks it is running free, but it is really tethered the whole way down the run. This is how digital currency circulates. When you transfer a digital payment to someone, your bank and their bank are the ones that actually agree to a new debt between each other. This is important because it happens billions of times a day. But let's envision a large international wire transfer to make the point clear. Let's say you want to wire a million bucks to your buddy in Hong Kong. The wire may go through in a day, but what has actually happened? What happened was that your bank promised the bank in HK that it would ship over a million physical dollars! And the HK bank accepted that promise at full value before it handed your friend a million bucks. No specially designed or officially approved electrons crossed the ocean through the wires. There was not physical "transfer." Only an agreement between two banks. An agreement to ship a million physical dollars! Now as I said, this happens billions of times a day and most of the agreements are cancelled out by promises in the opposite direction. But whatever is left unsettled ultimately gets settled in physical dollars. If the two banks are in the Federal Reserve system then the unsettled portion is settled by transferring cash held at the Fed. Some of those reserves at the Fed get moved over from Bank A's account to Bank B's. But remember, reserves held at the Fed are the same as cash, because the Fed prints cash. I can't stress this enough. This is what BACKS the whole entire system… that the Fed prints cash. Cash backs the system. Physical cash. It is the reserve, just like gold used to be the reserve. There is NO SUCH THING as digital money that has replaced physical cash. It is an illusion! And just because we have all bought into the modern banking system illusion of "digital currency" does not make it any more real. How real it is or isn't will be revealed when the system starts getting stressed! When institutions will no longer take the promise of another institution on the other side of the planet at full value! Right now the Fed is barely maintaining institutional confidence by throwing around guarantees like they are nothing. But what do you think all these guarantees actually mean at their very core? They are all, every one of them, guarantees to print physical cash at the end of the day. This is what lubricates the whole international free market. The confidence that HK bank has that the US bank will ship physical cash if need be. I realize that this is practically INVISIBLE to most of you, in a way similar to the allegory about the Peruvian Indians that could not see the Spanish ships when they first arrived because they had no prior knowledge of any such things existing. Because today you value that "digital currency" just the same as cash. Maybe you even value it more! So how can the HK bank possibly value physical cash more than promises from an American private bank? Well, once your wire goes through, your buddy in HK will have the option to walk in with a suitcase and get that cash. That is a physical asset the bank is holding. And it will release that physical asset to your buddy on the promise that it can get more from your bank at a later time. If someone else sends a wire for another million and the HK bank doesn't have enough cash on hand left over, it could create a credibility problem for that bank, right? …does the printing of physical currency require a banking panic leading to a bank run leading to a bank holiday? I think your question is, Is a bank holiday inevitable, unavoidable? I believe it is. And here's why. As I have said, hyperinflation starts before the first new dollar is even printed. It is a nasty little collapse of confidence in the currency (and its banking system) that begins in the hidden little corners you never even considered. Remember above I said that the HK bank accepted the promise from the US bank at face value? Well let's say that something has just happened in the markets somewhere that shook them up. Let's say that everyone is a little uneasy about something that just occurred. Maybe it was something strange at a Treasury auction, or… who knows? Anyway, at some point there is going to be a risk premium for accepting institutional promises of delivery of something physical in the future. That HK bank knows it will have to cough up the cash today if it accepts the wire, but it may not see the replacement cash for a week. Will that cash in a week be worth the same as the cash going out the door today? Probably. But if there's a chance that it won't, then there is a risk premium to be charged. This is one hidden little corner where that nasty hyperinflation bug may first appear. Once the time factor begins to present a perceived risk to the institutional banking system, it's all over. The system will need a large infusion of physical cash. Each and every "digital currency unit" is a debt of a physical dollar, backed by a debt, backed by a debt, backed by a debt and so on. It is a very long chain. And like all chains, it is only as strong as its weakest link! And there are a lot of weak links out there. The FDIC says about 800 of them right now if you believe the FDIC. When one of these weak links breaks, it will not be enough to simply feed the cash to that broken link. The time factor will come into play. The Fed will have to ship physical dollars to ALL the links in the broken chain at once to avoid a panic. This will require a large infusion of physical cash. Luckily this is possible today! Cash is the reserve, and cash can be created at will!! Back in the 30's, gold was the reserve, but gold could not be created at will. If it could have been, then they would have just closed the banks long enough to truck enough gold out to the banks. And it's not just the customers lining up outside the banks that forces this action. It’s the interbank settlement process and the interbank confidence that lubricates this process. And eventually it will also include the larger retailers, who operate with a huge degree of confidence in the bank clearing system. Think about the amount of promises a large grocery chain takes in every day with the confidence that settlement will happen before it needs to pay its obligations. The whole economy is like this. Whether one realizes it or not, the whole economy is operating on the confidence of the ultimate delivery of physical cash in the clearing process. How about a gas giant like Shell? Think of all the "digital money" promises it takes in with faith in the clearing system to clear all imbalances each night. There will come a point very quickly after confidence is shaken by some event, that physical cash will start to carry a small premium over digital money. This will be the time factor rearing its ugly head. I know of one cigarette shop that advertises a "cash price" in the window! This store charges less if you pay cash! That's not because of the time factor, of course… yet! But at some point those signs will start showing up at more places. Today most vendors will eat the 2% it costs them to accept digital money. But what about when that cost rises due to the time factor risk premium? If someone pays you in cash today, you can go to the grocery tonight and buy food with it. If someone pays you with plastic, it will take a couple days before Visa deposits 98% of that amount in your bank account. Will your bank have any physical dollars then? So that you can recoup the lost 2%+ by getting the better cash price at the grocery? Once this time factor settles in it will spread very quickly. The cigarette seller will prefer cash and will give you a discount for it so that he can go quickly and get the cash discount from the grocer. The banks will need loads of physical cash at this point. And they already have some of what they will need, sitting in excess reserves at the Fed. How much will the Fed have to print up, and how fast? Unfortunately, $1 trillion in $100 bills is still 10 billion physical notes. If the Fed tried to print that, all in hundreds, in one week, that would require a printing rate of 1 million notes per minute, or 17,000 per second, 24 hours a day for a week. In other words, it is impossible. But there is a simple solution! It's been used many times before and thus has many precedents. The euro already has €200 and €500 notes, presently trading for $254 and $636 respectively against the dollar. So it wouldn't be a huge leap for the Fed to print $500 and $1,000 notes instead of $50's and $100's in an attempt to hold the banking system together. It's actually a no-brainer. It reduces the printing time by a factor of 10! Now instead of 1 million per minute, it's only 100,000 per minute. Well, that might be tough too. So it'll probably take a couple weeks and even then be an insufficient amount. There's another option as well. They've got all those new $100 bills already printed. They could release the new bills at 100:1 on the old bills. Most people don't see this as hyperinflationary. They think of it as "issuing a new currency." So what's the difference between the two? There is NO DIFFERENCE! Issuing the new $100's at 100:1 would be the same as issuing a $10,000 note. Same exact thing. But you must realize, it's not the notes that are driving the collapse (hyperinflation), it's THE OTHER WAY AROUND. The hyperinflation is driving the need for the notes! So simply issuing the new $100 at 100:1 would not be an instantaneous devaluation of the dollar against all goods and services. No, they are rising at their own rate, REQUIRING a $10,000 note! Whatever you could previously get for $100, like a banana, would still be $100 in old dollars (for a few minutes anyway) after the new currency is issued. Most people don't think about it this way. They think of the issue of new currency as "solving the problem" or "stopping the collapse." They think it would cause an immediate 100:1 revaluation of all goods and services allowing the monetary authority "to get ahead of the hyperinflation" and stop it dead in its tracks. No, it doesn't work this way. Issuing a new currency is only a very temporary fix and worst of all, it feeds fuel to the fire. Hyperinflation is very hard to stop once it starts. The only way you can stop it is by switching to a harder currency. But unfortunately for the dollar, this will not be a realistic option. 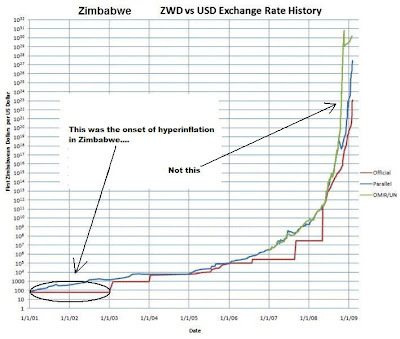 In Zimbabwe, they only stopped the hyperinflation by officially switching to a harder currency, the US dollar. But what currency could the dollar switch to? The euro? This is a possibility, but more likely the hyperinflation will simply run its course over a few months and by that point we'll ALL understand Freegold. FreeGold and FOFOA, protect me!! Absolutely brilliant piece of writing. I only wish I could have said it so eloquently. thanks FOFOA, i really appreciate your services. i noticed you mention maples a lot for some reason lol, why is that. i would think you would prefer eagles.i get my maples for $35 over...no tax :) but if i am not mistaken some provinces in canada still tax gold maples. so much for freegold in canada. Nick Barisheff (BMG fund manager) once mentioned that Canadians are the worst when it comes to gold knowledge in the world and don't care about holding it and that is the reality i see. you have to beat them up for them to own gold. the way i see it is like similar the USA, Canada will just nationalize the gold mines but can you imagine how much gold would be worth here once freegold takes off. We know where that line is.. But at the line which will really matter in the future... you could be waiting a very long time...and perhaps you can earn yourself a better place in line... meritocracy..
For what it's worth about the cash-premium, for as long as I can remember in Hong Kong (that's 20+ years)... at anywhere were margins are slim (eg: clothes or electronics stores) prices are always the cash price... if you pay by credit card, you pay the processing premium as well. A good follow-up FOFOA, thank you. I've been reading your work now for about a month and have learned a great deal from you (as well as from the writings of Another and FOA). For that I thank you. This was a very interesting piece. I have a question for you and would appreciate your perspective. As you stated, when currency was backed by gold bank failures resulted from an inability to deliver the gold to back the claims on it. Now we operate in a system where digital currency is backed by physical paper notes. You mention that when faced with bank failures the Fed will either print or add zeros. This seems like a likely possibility. What do you suppose would happen if instead of delivering the physical notes they declare that digital currency will no longer be convertible to physical currency? It seems like an absurd notion; however, when considering that the dollar survived even after the link to gold was severed it is a notion that warrants consideration. I have described how the system, as presently constructed around physical monetary notes as the reserve, must hyperinflate in the end. If gold could have been printed, then gold would have been printed to oblivion in the 1970's rather than closing the gold window. But you ask an interesting question, what if they changed the construct of the system at that point? As I have said, political will is an underestimated force by the deflationists, but not by me. And they have certainly done similar in the past. Simply cut the parity between the money and its reserve. They did it in 1971, why not now? Secondly, what would be the effect of doing that? Would it be a cure? Or would it be instant death? Would it stop the hyperinflation? Or would it instantly kill whatever was still functioning in the banking/monetary system and the economy? All interesting things to think about. Perhaps you read Willem Buiter's proposal yesterday in the Wall St. Journal to do precisely what you suggest. To get rid of physical currency! Is this the Right Time for the Fed to go Negative? "This can be done in three ways: abolishing currency, taxing currency and ending the fixed exchange rate between currency and bank reserves with the Fed... The first method does away with currency completely. This has the additional benefit of inconveniencing the main users of currency—operators in the grey, black and outright criminal economies..."
... including this line: "If the goal was to produce hyperinflation and complete loss of faith in the currency, the suggestions of Buiter just might do it..."
Do you remember when Greg Mankiw had the proposal of removing the legal tender protection on 10% of the monetary base? In other words, you couldn't pay your taxes with dollars with serial numbers ending in, oh, say 3. Just pick a number. You couldn't deposit them either. They were done! 10% of that mattress stash GONE! It's all about making money easier, not harder to get. Easy money! They did it before, why not do it again? Just cut the parity with the monetary reserve, whatever it is. Gold went up when they did this last time. What do you think dollar bills will do? Political will (stupidity) is a very powerful thing! But as I say, all these "brilliant" economists focus only on the transactional currency, the medium of exchange (which they can control through legal tender laws), with nary a thought toward the more powerful store of value function in the common understanding of money. A function with a natural barrier between it and the laws of legal tender!! I say fine, Willem, do it! Freegold here we come! It will be nice to not only be able to borrow money at negative interest rates when I need it, but to also watch my savings go up in value two or three orders of magnitude overnight! Booya! Bring it on, baby! When Fekete talks about gold being "the ultimate extinguisher of debt," he means ultimate as in best. But gold is not the ONLY extinguisher of debt. In fact, ANYTHING in the physical plane of existence is an extinguisher of debt, when debt exists only in the monetary plane. Gold is simply the best, because that's its only function, as a connector between the two planes. But these geniuses figured out a new "connector" which they could create at will! But now it seems even THAT has become too big of a burden to this easy money crowd. Can you see now why it is a GREAT thing that gold, the ultimate extinguisher of debt, is SEPARATE from the people's money that must ALWAYS be made easier so it can be loaned and borrowed even when nobody wants to loan or borrow? Sure, delete physical currency, then all those "grey, black and criminal market hoarders" will no longer hoard cash which you can create. Instead they will hoard gold, which you cannot create. Is it possible that $US can be converted into something like the Euro with two separate functions - 1. as a medium of exchange and 2. as a storage of value. Supposedly the new US $100 bill that will be distributed in February 2011 will have a blue line down the center with the left side of the face like the present US $100 bill and the right side of the bill with lots of gold color. Is it possible this could reflect a coming change in the US$ with two separate functions joined together in the US$ - 1, as a medium of exchange(easy money) and 2, as a storage of value(hard money)? Is it possible that the dollar could be on the verge of becoming more like the Euro? Thanks for linking to the second Gonzales piece on hyper-inflation, it is so important for the truth about Chile to finally get out, the progressives and leftists insist on living in their propaganda bubble and refuse to accept that Allende was a marxist like Castro, Chavez, Lenin and Our Leader. Most Europeans especially have a difficult time removing their anti-American blinders, so many insist even today that under Allende, Chile was on the verge of becoming a socialist paradise like Sweden. It is these same European elites who have fanned global warming hysteria, promoted an agenda of unrestricted Muslim immigration and "tolerance", and have constantly pushed the decay of national sovereignty, the latest sad examples of which are the Lisbon accord and the ECB starting quantitative easing. "And they miss it because they are so meticulous in their observations and calculations that they can't see that the collective will always changes the rules when things get really painful. The political will (which is the same as the collective will in my lexicon) always does whatever will lessen the immediate pain, even if it will most certainly cause greater pain later. This is the part that is as reliable as the sun rising." But you miss that this statement applies to the EU, the EMU, and the ECB too! The PIGS citizens who are so loath to pay their own taxes are reflected in their national governments. None of the EU members trust each other, and especially the southern lands will cheat the northern lands just as quickly as they do on their own taxes. They hate their own governments, and they certainly don't trust the EU in Brussels any more than the ones in Athens, Rome or Lisbon. "What else? Oh yeah! They convinced the EMU members to stop selling off their gold. This was a big problem". While the gold and foreign exchange reserves of the national central banks remain in their possession, all gold and foreign exchange reserves are, under the terms of the Maastricht treaty, at the disposal of the ECB. " If some Greek banks or the government defaults, and it turns out that their NCB gold or even their share of the ECB gold reserves is gone or encumbered, what then? Germany would be about as likely to bail out Greece on those terms as they would be to start a war with Russia over Latvia. And besides, the will of the EU ruling class is just as amoral and self-centered as that of the US ruling class, and their interests often coincide. Just look at OECD tax policy, AGW, and efforts to get the entire world on VAT. None of the Dollar, the Fed, the Euro and the ECB deserve to survive. Many Europeans are dumping Euros too, they are driving the CHF and PM's to record highs. I hear you, and I am on your side on this political issue. But I'm afraid that your loathing of the ECB, the BIS and all central bankers in general is blinding you to the bigger picture. Central bankers are a different breed than commercial bankers. They think "big picture" while commercial bankers only think $$$$'s. And European central bankers think differently than American central bankers. They have for a half century now. I don't expect you to believe this after all the stuff I'm sure you've read on the Internet, but at least I've said it. If we truly rid ourselves of this scourge you see, we will one day face la Terreur again in the future. But there is a better way! I agree with all your complaints about European Socialism. And if you think you can rid the world of sloth and laziness, then by all means, keep fighting. I am on your side. You say, "None of the EU members trust each other, and especially the southern lands will cheat the northern lands..."
There are benefits and costs to a shared currency. The benefits are many, but the biggest cost is to the savers, wherever they are. If you have no savers, then inflation is bearable and the cost is minimal. Or, if the savers can save in something other than what is freely dumped in the pigs' trough for free feeding time, something that actually floats in that slop, then you have eliminated the biggest problem with inflation. To people that simply earn and spend thier earnings within the same cycle, inflation is bearable. Especially since these same people tend to go into debt, and the inflation eases the burden of their debt to the banks. So for them, the cost of inflation is somewhat balanced between the easing of their debt and the slow rise in prices. The people that get cheated the most (and I say "people" as it can mean individuals or groups/nations like your "northern lands") get it through the diminished purchasing power inflation wreaks on their savings. While the cost of a gallon of milk rising 10% in a year will be hardly noticed by the debtors, a 10% decrease in the wealth of the savers is a really big deal! As for where the gold is, the official Eurosystem reserves include all the members' reserves. And they are physically in their respective countries. But they are now Eurosystem reserves in that they cannot be unilaterally squandered. In a monetary sense, the Eurozone is now a whole. And the only "encumbrances" that will be honored when the paper gold market goes are to other CB's. Us little guys that are holding paper gold will be SOL. This was a major part of Another's message. I can see that you put all central bankers and politicians in the same "ruling class" basket whether from the US or the EU. This is not what Another and FOA taught us. And if they were wrong on this account, they were probably wrong on a lot of things. Do you agree? Or do you think they were just Eurotrash political/CB hacks sent to pump up the new euro to a few American goldbugs? Or do you buy their basic gold arguments but nothing they said about the ambitions/agendas of the ECB and the BIS? Just curious. FOFOA, hats off to you my friend! I am posting this just halfway reading the post... hats off to you! You are providing a service for free that the paid commentators, even if put all together may not be able to do.. Indeed you are squandering the knowledge of generations on us your readers! Before I started reading your blog I can assure you that I was worse than the Joe next door, looking at the world with red tainted glass spectacles! Fofoa, frankly, I am too lazy to read the entire archives of Another and FOA. I have read some of their posts and the snippets that are often posted here on your blog. I don't recall reading much about differences between central banks and the ruling elite. I have lived in Europe for almost 25 years and have formed my own opinions about the EU. The "genius of the Euro architecture" changes the nature of the EU no more than the beauty of a mosque does the nature of Islam. If you and Another prove me wrong in the end, that the ECB hasn't aided the EU's continued theft of our freedoms but have actually cut government, cut corruption, cut regulations, and increased my freedoms, then I will be a happy man. On your response to Buiters proposal, I think they will try it. It would be the holy grail for TBTF bankers to control every transaction. In Europe, many small transactions are completed by bank debit cards. Unlike credit card transactions these are booked automatically and immediately. Train tickets, vending machines, kiosks all work with this e-money. Other bills, like those from handworkers, are usually settled with online banks. I think the entire OECD will keep trying to squeeze out all cash until they are presented with the right crisis, and they will try to force the switch. There are so many signals that this is coming. Greece and Italy are both attempting to ban large cash transactions. The healthcare bill had this $600 1099 reporting requirement. Obama has programs to provide free cellphones to the poor, which would then be perfect to use for E-money and E-foodstamps. And now we have Buiter, from Citi no less, pushing this idea. 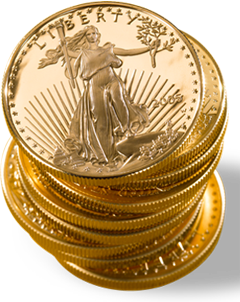 And isn't replacing paper dollars with E-dollars just another step in the progression from gold=>gold backed paper=>paper=>E-dollars? I think if they get the chance during the coming crisis, they will seize it under the guise of "getting money to the people" or "stopping those hoarders" or "fighting inflation by enforcing price controls". And I have little doubt where the EU, and the ECB, will stand on the issue. No, I had not read that piece by Buiter. I tend to avoid exposing myself to the Wall Street Journal (among certain other print and television media) because somehow I always feel a little bit LESS informed after processing the information in my brain. I did read the Buiter article just now at your suggestion and found it interesting that severing the link between digital money and reserves at the Fed would be suggested. The advantage of such a move would be that the "run on the bank" could be avoided without the public spectacle of printing money or adding zeros. It would not fundamentally change the structural soundness of our current money system. After all, if you back the currency by a physical item that can be created quickly, easily, and essentially at no cost then what difference does it make backing it by nothing but digits in a computer?!? The only real difference would be public perception. How would the public react to such a change? That is the question! My guess is that hard money advocates would howl in laughter and derision. Those who currently trust in the system would probably yawn and go about business as usual. Some among the existing group of sleepwalkers may become aware and start seeking refuge in gold. Would it be enough to reach a tipping point? As you have stated, the timing of the inevitable earthquake is unknowable. Until then, it is probably best to seek refuge in real assets rather than in digits. @Desperado can you please keep your Islamphobia to yourself please ? I did not respond to your Migration of Muslims issue because it is your land and you have a right to allow or disallow people from living there , but I think your take at the nature of Islam is uncalled for, Do you claim to have studied Islam in full to know the beauty or ugliness inherent in its nature ? If you have seldom read the archives of FO/A then have you taken the time to read the Quran ? @FOFOA, sorry for this post, but I had to speak up. FOFOA, I really enjoy your posts. Please keep it up. That being said, I cannot agree with you on the odds of a hyperinflation in the US, for the simple reason that no institution ever knowingly destroys itself. My view is that the Fed is going to permit a decade or more of high unemployment and a stagnant to slowly shrinking economy, before they would tolerate wheeelbarrow style printing. That doesn't mean they won't do more QE, but QE in and of itself only keeps the banks and insurance companies solvent, it's not designed for broad economic "relief". gated funds with extra interest, and/or disincentivize withdrawals with some kind of transaction tax. Ie, they shut the system down. Will that spark a flight to gold? Yes, as would Buiter's proposal which is just about the nastiest piece of economic policy I have ever read. But with the system gated, you aren't going to have hyperinflation, you are going to have massive deflation. Everything will be hoarded including cash, transactions will simply cease, and then the government will start gradually reinjecting funds. This is exactly what happened in Argentina in the naughts postdeval, and exactly what happened in the US post Lehman. I guess if you saw some massive policy shifts in the Fed, or we had a Lehman style crisis every couple of years so that the thing just collapsed, then yes maybe we would have hyperinflation. But I don't think conditions are there for that now, or even close. @Samix, you are right, this forum is not the right place to debate the merits of islam, nor is it the right place to smear people PC platitudes like "islamophobe". If anyone has a link for EUR as store of wealth and medium of exchange, please post here. I have not been able to see how this can work since there is only one Euro. From what I know a buyer of EUR bond from the separate countries do not have a claim on Gold. Similarly when the issuance of debt is increased the Govts are not buying new corresponding Gold. "The latest findings of Eurobarometer, the EU’s own polling organisation, show that less than half its citizens now believe it is a “good thing”. In many countries, its popularity is at record lows, and only 19 per cent see the EU as “democratic” (in Britain, Finland and Latvia this is as low as 10 per cent). What makes this particularly ironic is that in 2001 the EU’s leaders issued their Laeken Declaration, admitting that the EU faced a crisis through its “democratic deficit”. Their remedy was the process designed to give Europe a “constitution”. After eight years of negotiation, obfuscation, lies and referendum-reverses, they got the constitution they wanted (although they had to disguise it as the Lisbon Treaty). The upshot of this tortuous attempt to “bring Europe closer to its peoples” is that those peoples see the EU as less democratic than ever. " I am not against a EU monetary union. But my support is given only as long as it is moderately abused by politics and they dont place a VAT on gold. And I determine what "moderately" above means according to my political prerogatives. I am, on the other hand, firmly against turning the EU in a superstate. There are many arguments why. But there is only one that should be enough in any discussion: Holland and France voted against it. The message here is that there is a fine line dividing the two things above. We should be careful not to mix the two. @Aleksandar, one of the main lessons from the US for the rest of the world is that even with the simplest and most concise constitution in the history of mankind precisely limiting the role of government, the politicians have whittled away at it so much that over the course of 2 centuries every law coming out of Washington does little else but make a mockery of what the founders originally fought and died for. Every time a village, community, canton or country passes sovereignty up to bigger organizations, they erode the freedom of their own citizens by precisely the same degree. And the exact same rule applies to corporations. TBTF is an obscenity against human kind. The EMU is little else than the exact same kind of attempt to extend control up to ever larger organizations. The EMU was a travesty, and there should be no tender laws allowed that restrict the peoples choice of currency, and that includes VAT. "Fofoa, frankly, I am too lazy to read the entire archives of Another and FOA." "...no institution ever knowingly destroys itself." You are implying that they actually have a choice. That may be a faulty premise. I think it is a real stretch to assume that the Fed would knowingly kindle hyperinflation, or even that the US gvt would do so. It is no one's interest. I think the plan you see now is the plan. Extend safety net benefits to as many as possible and triage the TBTF in whatever industry. Stand ready to inject another trillion if the thing starts to slip again. Etc. My view is that the most likely negative scenario is that foreign holders of dollars will very quietly defect and reweight their baskets with commodities. Very very quietly. At some point, there may be a spark of recognition and the dollar may suffer an instant devaluation. Maybe. But I think it will much more gradual. In the US, dollars will remain scarce for most. The Fed will continue to be concerned, and do what it can on the margins. It will also continue to pass the buck, as many of the recent speeches have been about structural unemployment and how the next move should be fiscal, knowing full well the current political environment won't permit it. This a controlled demolition, plain and simple. terms. Call it stagflation, call it biflation, whatever. But the Fed is not going to permit 10 trillion of FRNs to sloshing around. Not even half that. No chance. "I think it is a real stretch to assume that the Fed would knowingly kindle hyperinflation"
"But the Fed is not going to permit 10 trillion of FRNs to sloshing around." using the words 'knowingly' and 'permit', seem to assume that the Fed will have control over events. I think FOFOA's outstanding 2-part hyperinflation post shows that hyperinflation happens when the fed LOSES control. Then the 10 trillion FRNs come about as a knee-jerk reaction to the crisis, to keep the government functioning for a few weeks longer. Your suggestion that the government might 'gate' accounts as they did in Argentina is an interesting one. I wonder if the fact that the USD is the world reserve currency would make this strategy unworkable unless the USD is gated everywhere in the world. ANOTHER mentioned that foreign USD holding will want to repatriate, and it won't be pleasant for the US. "I think the plan you see now is the plan. Extend safety net benefits to as many as possible and triage the TBTF in whatever industry. Stand ready to inject another trillion if the thing starts to slip again. Etc. " This is precisely why we will have hyperinflation at the end. It's always 'just' another guarantee against losses, and 'just' another trillion in QE purchases. Right before and after WWI Monnet hooked up with leading figures in the Anglo-American establishment. One of the first was Lord Kindersley, who during his life was a partner in Lazard Brothers, a chairman of the Hudson's Bay Company, and a director of the Bank of England. Kindersley's son is known to have become a Pilgrims Society executive." Maybe you can now better understand why Europeans are not happy with the Eu&EMU! Wow! That website you linked is quite the comprehensive "Illuminati" repository! "For all the people who have faith in the alternative media: Alex Jones only published this article (as a news item) on Prison Planet after paying him $500. And only then did several other major "alternative" sites pick it up (Rense; D.I. in the UK; H.M. in Canada). But interestingly, soon thereafter, the amount of money offered didn't seem to matter anymore. After some initial support years back for several superficial articles, they mostly refuse to link to the infinitely more detailed and more documented articles about the Pilgrims, the 1001, Le Cercle or the follow-up articles of Beyond Dutroux." Must be some pretty credible information in there if even Alex Jones won't touch it anymore! Sounds like no one wants to touch Le Cercle! Must either be too hot, or too incredible!? About the website: "ISGP has begun to change that. It is the first site - or any source for that matter - that has systematically researched Western elites based on names, places, and dates, backed up with reliable sources." Majestic-12... MJ-12 is said to be a highly secret intelligence agency set up for the purpose of investigating the UFO phenomenon... Another problem is that the CIA group surrounding Ted Shackley, Thomas Spencer, Jr., and James Angleton, Jr. have been involved with authors writing about MJ-12 and Roswell. See 'Le Cercle and the Struggle for the Eurasian Continent' for that." Wait, is that the same Le Cercle that you want me to read? Why yes it is! I:m not so sure you want to read this:"
"The American public is alarmed at what they see going on. Most of them do not understand what has been done to them. The propaganda fed to them daily has them completely confused and that is understandable......."
Seems like smart money is flowing to Asian economies ? FWIW whenever I feel swayed (rarely these days) from my conviction that hyper-inflation is the final destination for the US$ I review a few of the external and internal forces at work. The following is only a small sample. 1. Even though velocity is low at present it retains the potential to cause hyper-inflation. If any amount of currency in circulation turns over at a high enough rate you have hyper-inflation. 2. The USA cannot pay its debts and unfunded liabilities. It is a mathematical impossibility based on the official numbers let alone the real numbers. I take it as a given that the USG WILL default. Who can stop them? No one has the military muscle to force them to honour those debts. So, for me, the question is: which method of defaulting will the USG choose? Fast or slow? What if the USG isn't given the luxury of choosing the method and timetable? 1. The US$ and US$ denominated securities are (collectively) the most widely distributed "currency" in the world by several orders of magnitude. The USA is dependant on imports, fact! Rejection by one or more key suppliers can trigger a collapse in confidence in the US$ resulting in the imposition of hyper-inflation on the USA. 2. The use of the US$ in world trade and finance is critical to its acceptance as the premier reserve currency. Many countries, including China and Russia, are moving to trade directly in their own currencies. Reducing the use of (reducing demand for) the US$ in world trade and finance moves the currency closer to a critical failure point even if supply remains constant. If International demand collapses there could (would?) be attempts to repatriate those US dollars to the USA especially if the exchange value of the US$ is artificially supported in the USA. If the USG slams the door on attempts to repatriate US dollars who else would want them? Result = Zero demand for US$. Checkmate. Enlightening post, as always. You've helped me understand things which were not clear even after following gloom sites for the last decade. Regarding the VAT on silver (also platinum): where I live (Belgium) there is 21% on silver bars. Old coins (the local equivalents of US 90% coins) can, however, be bought without paying VAT. Go figure. Regarding the 'gating' of accounts, would this action not have the opposite effect of the discontinued use of cash? In other words, the black market, drug dealers, tax-evaders, and tin-foil-hat-types who have large amounts of cash outside of the banking system would suddenly have more importance and influence on the economy, since most people would have their access to cash (and even balance-sheet money) severely restricted. Unless, that is, you gate accounts at the same time that you discontinue the use of cash. "Hyperinflation accompanied by a housing collapse is simply impossible - by definition." Weren't people buying up buildings in the Weinmar Republic for a gold coin? Mish doesn't get the point. It is not about who is to ignite the hyperinflation (set off the velocity of money). No of course, the FED won't do that. It can be anything, but once it happens then the amount of money in the system is there already to support the velocity to get to hyperinflationary speed. The enablers of this possibility are #1 the FED and #2 Congress. They allowed cheap money to flow into the system, and spend twice the amount of money the get in in revenue. That is supporting an environment, in which people can loose confidence overnight in the currency. There you have it: loss of confidence. It can happen to any currency/commodity, but usually if it is not too much abused, it won't happen. "Is it possible that $US can be converted into something like the Euro with two separate functions - 1. as a medium of exchange and 2. as a storage of value." Why wouldn't the new US$ be designed to function the same way? Just read the Mish article. Shouldn't have bothered. "monetary purists worried about money supply alone are under the preposterous notion that we are trending towards hyperinflation." How do you trend toward hyperinflation? Is it like trending towards falling off a cliff? On a personal level, since the future is so uncertain, costata's quote of GG: "Buy.Gold.Now." is quite correct for anyone who has less than 5% of their wealth in gold! Even mainstream asset managers will go along with 5% - 10% of assets in gold. Re the Euro. I have not read enough of the archives to be fully informed of Another's and FOA's views to adequately critique them. But, looking at what politicians have done HERE in the USA to the Constitution, well, Euroland seems to be ripe for dismantling such well made plans for the Euro (lots of gold to back it up). Different languages, cultures and countries. Disclosure: I have traveled in Europe a fair amount, but I do not believe that Euroland can any better manage its affairs better then we do. Hello dear Robert, my physical gold donor and supporter! "There are a lot of ways this could go. Deflation, then hyperinflation is my working guess and my working probability as I do my own financial planning." Some events have such a high impact that timing becomes secondary. As they say, "better to be years early than a minute too late." "I do not believe that Euroland can any better manage its affairs better then we do." What if politicians and easy money can't ever be controlled, at least not without eventual bloodshed? Is it not enough to simply separate the savers from the debtors' profligacy? I have never said the euro is a cure-all. And as a currency, the euro is designed to withstand and survive the profligacy of the masses and the politicians they elect. It is this simple function that will also save it as the dollar goes down. My best advice is to reserve your judgement of the euro until after the dollar is no longer a global reserve currency. Then we'll talk about the euro! What happens to peoples wages when they perform a 100:1 old currency for new currency? Unless wages rise by x100, that's a heck of a pay cut. I can't imagine many people being very complacent if that happens. "What happens to peoples wages when they perform a 100:1 old currency for new currency?" Nothing happens. Wages are the same denominated in the old currency, or they are roughly 99% less in the new. "Unless wages rise by x100, that's a heck of a pay cut." Not if you read my post closely. The new currency isn't the cause, its the effect. And it's certainly not the cure. A pay cut in nominal terms. Got it. My brain must be full, time to go watch some reality TV. So the currency loses two zeroes, your wages lose two zeroes, and all prices at the store lose two zeroes. There really isn't any change at all; it just makes for nicer-looking bills. Its likely that, during the transition, you'll still have $10,000 'old dollar' bills circulating alongside $100 'new dollar' bills, until all the old bills can be removed from circulation. You make a compelling argument. However, if it were only about political will, then the BOJ would have been able to right the ship. Obviously, they have not been able to do so and they have had, for the last 2 decades, deflation, not hyperinflation, as you envision. Why is this since the government controls the political will and can change the law and rules? Who is FOA? You say "friend of another," but you also say "FOA says." From Goldnews: "Priced in the Euro, gold actually fell following the US Fed's announcement, pushed down by the single currency's new six-month high above $1.33. Early Wednesday in London, the Gold Price in Euros slipped towards €31,000 per kilo – its lowest level in almost 3 weeks." ....Is it me, or is that about 0.05 kilos or $2000 worth of gold in difference??! I think I'll just stick with Vreni and ignore it all!!! The stock-to-flows ratio of gold is extremely high (higher than any other entity, no?) 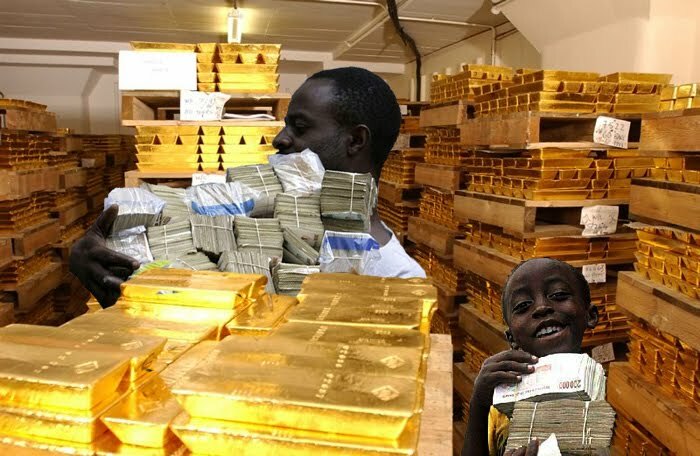 - so while it is true that gold production cannot be ramped up as in the case of condoms, changing investor attitudes or government intervention can make any quantity of gold available (up to the 150,000 ton stock limit). Would this not have the same effect as excess production stimulated by rapidly escalating price? I recently found your blog and love it! I've followed pertinent-to-me internet information since 'the crash' and your blog is the most common sense one I've found yet. I especially appreciate you coming from gold as a foundation, and knowing what really holds value for us humans. Gold Std goes bye-bye 8-15-71.
hey, who's counting)... just for grins, we'll use the 100.41. Prime rate at the time 6%. Let's see, on 8-24-10, S&P was... voila..... 1051.87.
there you go.... exactly as planned. Read Maharishi Kapila's Samkhya Theory. It explains the theory behind the formation of the universe through combinatorial mathematics (the mandlebrot set is based on just that). Yoga is the method for self realization. In this state, Samkhya will be self evident.